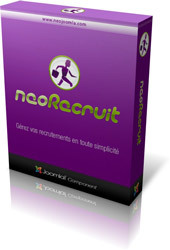 NeoRecruit version 4.2.1 is available ! A new version of the NeoRecruit component has been released, this is a security release for the 4.x series of NeoRecruit. This release fixes one hight level security issue. This new version also fixes several bugs and improves some features, in the search form and in the back-office.